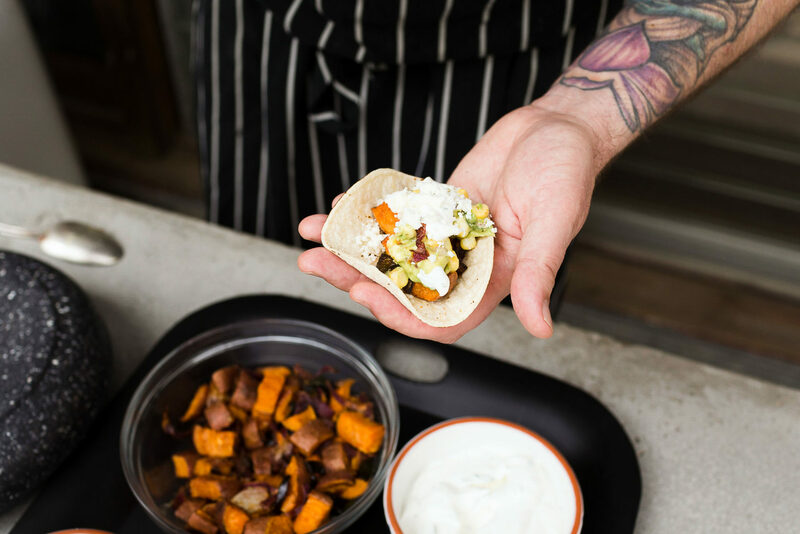 Celebrate the summertime with these delicious [not to mention gorgeous] sweet potato tacos– from the kitchen of our fave chef, Jason Paul. 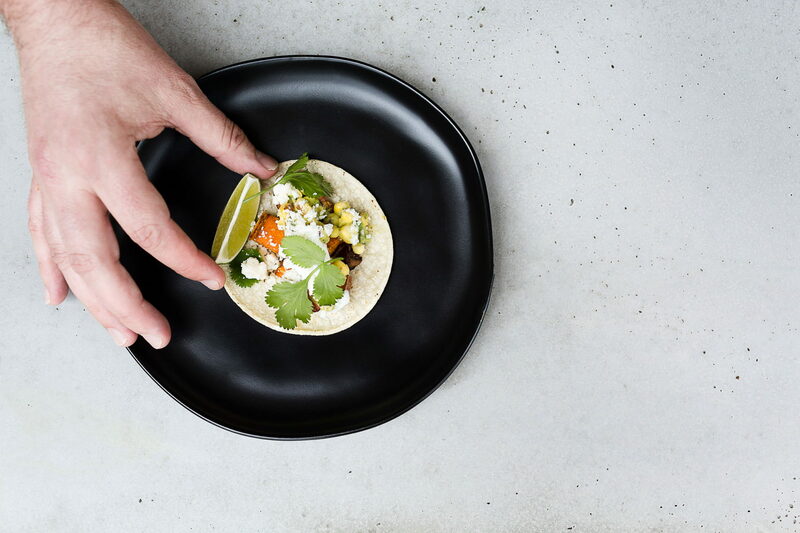 A festive twist on the classic taco, this beauty is nourishing, easy to whip up, + will leave all your friends begging for your recipe. Head on down to the farmers market for the freshest ingredients and follow our lead. Wash + cut sweet potatoes in half and then into 1/4 inch wide slices. Place in a large bowl. Remove seeds from Poblano, and cut into ½ inch slices. Add to bowl. Cut red onion in half and then into ½ inch wide slices and add to bowl. Toss all vegetables together to mix well, and stir in vegetable oil, cumin, cayenne, and season with salt + pepper. Spread potato mixture onto a baking sheet and cook in the oven at 375° for about 20 minutes or until potatoes are tender [but not mushy]. If onions or peppers get slightly charred, don’t panic– you’re right on track. 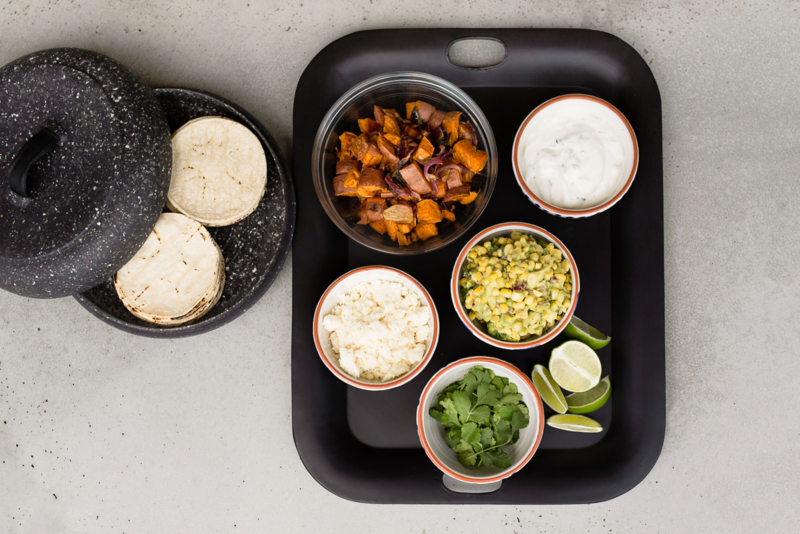 To serve, gently heat tortillas and spoon warm potato mix into each shell. 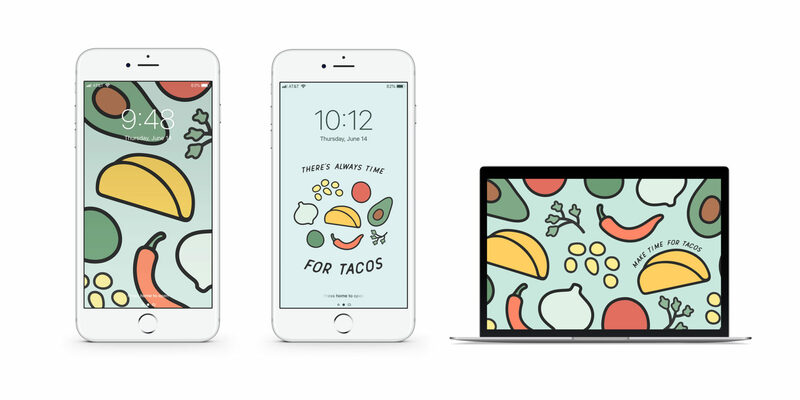 Top with fresh cilantro + your favorite condiments [two tasty options below], and dig in! 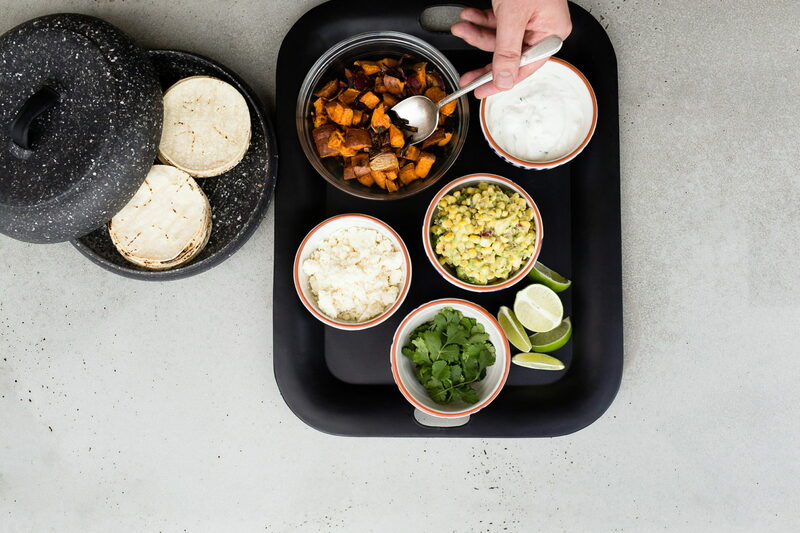 Mix all ingredients together in a small bowl + chill until ready to serve. Start by heating a heavy skillet over medium high heat and lightly char the cut corn kernels. Remove from heat to cool off. In the mixing bowl, remove avocado from skin and mash using a fork. Add cooled corn, minced red onion, lime juice, cilantro + seasoning. Mix well + adjust seasoning to your liking. Chill [covered] in the fridge until ready to serve. Enjoy!